This ticket reserves your place on the course and covers a 50% deposit of the full £300 course fee. A balance of £150 is payable by cash or cheque on the first day of the course (balance reduced if a discount applies). Deposit refundable if 5 weeks' notice is given. 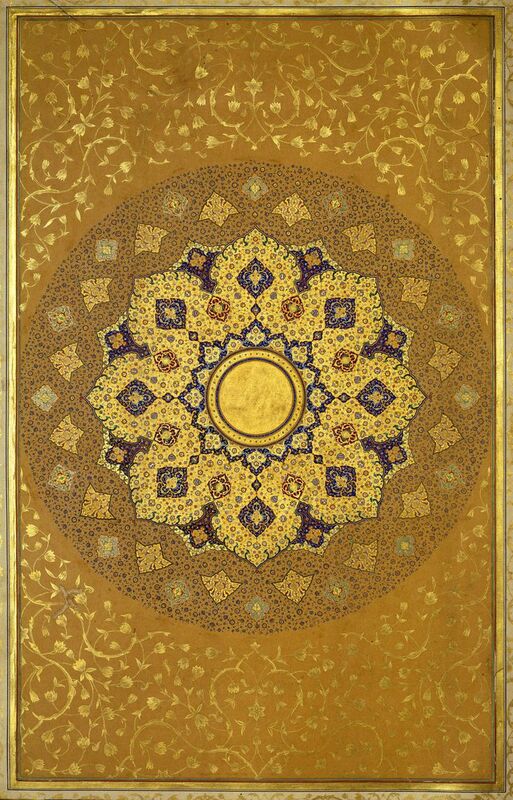 Focusing on the beautiful "shamsa" ("sun-burst") composition, and intricate floral designs, students will explore the rich and varied forms that exist in Islamic manuscript illumination. They will learn how to paint illuminated plant and floral motifs using techniques known as "halkar" and "tarama". Students will also learn essential design princples that go into creating floral compositions. This course will allow students the opportunity to learn about traditional painting and gilding techniques used in Islamic manuscript illumination, including making and usage of shell gold and handmade watercolour paints. We will also look at the the artistic and historical context within which this art developed. By the end of the course, each student will have created at least one illuminated shamsa. Learning will be supported by illustrated talks, practical demonstrations, one-to-one tuition, and course handouts for students to keep. All art materials, including gold leaf, pigments, specialist paints, and papers are covered in the course fee. Classes take place in a new studio space in the beautiful town of Windsor, just a few minutes' walk from Windsor Castle and the River Thames. - Alma Road Car Park is also just a 2 minute walk away. - The King Edward Court Car Park is a 5 minute walk away. - Windsor and Eton Central Railway Station provides easy access to London via Slough, and is just a 5-10 minute walk from the venue. - Windsor and Eton Riverside Station is a 15 minute walk away, and links directly to London Waterloo. - The area is also well served with local bus links. We are situated on Alma Road, next to the Copper Horse Pub. There is a gallery at the front of the building. Please ring the blue doorbell on the left when you arrive. The studio will be offering further illumination courses that give students the opportunity to expand their skills base, and learn about the subject in greater depth. In addition, students may progress to other courses in Islamic art e.g. Islamic geometry and/or floral design (islimi). The rich and varied disciplines of Islamic art all complement each other and serve to improve a students' skill and creative practice.